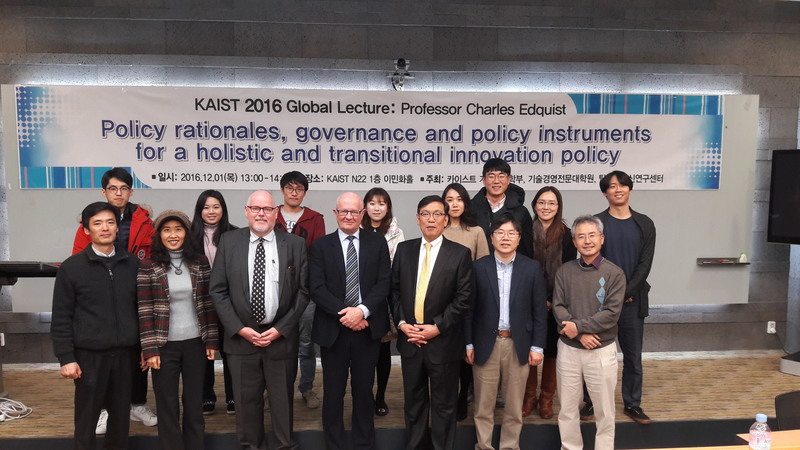 During November 29 – December 3, 2016, Charles was a guest at the Korea Advanced Institute of Science and Technology (KAIST). He gave the so-called “KAIST Global Lecture”. The topic was ”Policy rationales, governance and policy instruments for a holistic and transnational innovation policy”. During the visit to Korea he also gave a seminar at the Science and Technology Policy Institute (STEPI) on ”Innovation-related public procurement: Demand functions instead of products!” He also gave comments to the PhD projects at a Graduate Students Presentation Session and provide advice to the PhD students.